The first requirement of our assay qualification algorithm was a mononuclear cell viability post-processing of ≥80% per brain or spinal cord sample. (A) Brains and (B) spinal cords from individual mice with experimental autoimmune encephalomyelitis scores >2 were dissociated with Percoll PLUS, Neural Tissue Dissociation Kit, or incubated with accutase or papain for 15, 30, or 60 minutes. Cellular viability was determined with the LIVE/DEAD Fixable Aqua Dead Cell Stain Kit. The mean of a minimum of 4 separate tissue dissociations are shown. (A) All enzymatic dissociation methods yielded high enough total live cell numbers to meet our second criterion, and accutase 15/papain 30 showed significantly higher numbers of live cells than accutase 15, papain 15, papain 30 and papain 60. 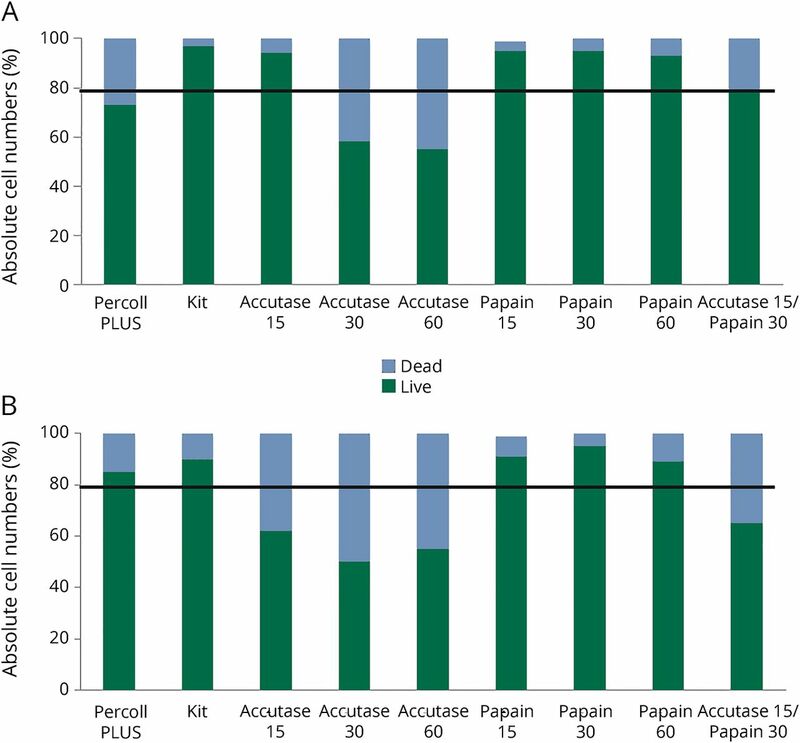 After enumeration of total live cells, Kit treatments yielded a higher median cell number than accutase 15/papain 30. (B) Treatment of spinal cord tissue of mice with clinical experimental autoimmune encephalomyelitis with different dissociation methods demonstrated that the Kit and papain 60 yielded sufficient cell numbers for further flow cytometiic analyses as pre-defined by the second criterion. (C) When mononuclear cells isolated from the brain were gaited on CD45+ cells, Kit enzymatic dissociation yielded a higher median cell number than other methods, including accutase 15/papain 30. 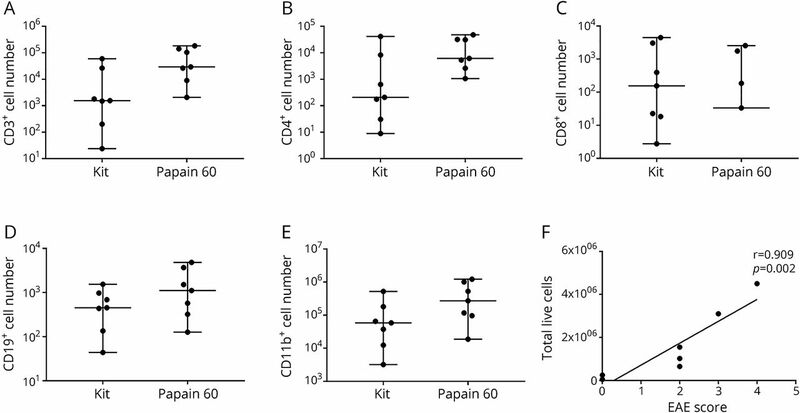 (D) In the spinal cord, numbers of CD45+ cells were similar between Kit and papain 60. Groups were compared for normality by using the Kolmogorov-Smirnov test. Values were compared using the non-parametric test Mann-Whitney U test. *p < 0.05, **p < 0.01, ***p < 0.001. The third pre-defined criterion of our assay qualification algorithm was test reliability. As stated in the method section, the 95% confidence interval of the mean was calculated to express the precision and repeatability of each dissociation method tested. Then, the coefficient of variation (CV), defined as the ratio of the SD to the mean was computed. The CV shows the extent of variability in relation to the mean of 2 experimental samples. In this study, the CV was set to ≤25%, given the heterogeneity of experimental autoimmune encephalomyelitis (EAE) disease activity. (A) Following the enzymatic dissociation of brains from mice with clinical EAE, Kit, accutase 15, and papain 60 met the criteria. (B) Kit and papain 60 were sufficiently reliable when used to dissociate spinal cords. 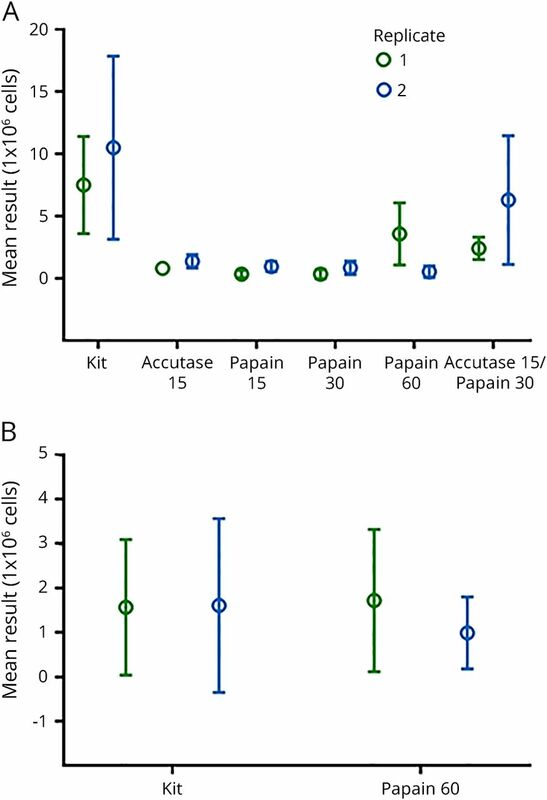 (A) Accutase 15/papain 30 and Kit yielded the highest CD3+ T cells numbers, and the difference between accutase 15/papain 30 and papain 15 was significant. (B) There were no differences between any of the experimental groups regarding to CD4+ T cell numbers, or (C) CD8+ T cell numbers. (D) Enzymatic tissue dissociation with Kit offered the highest amounts of CD19+ B cells, and the increase in cell yield compared to accutase 15, papain 15, and papain 30 was significant. 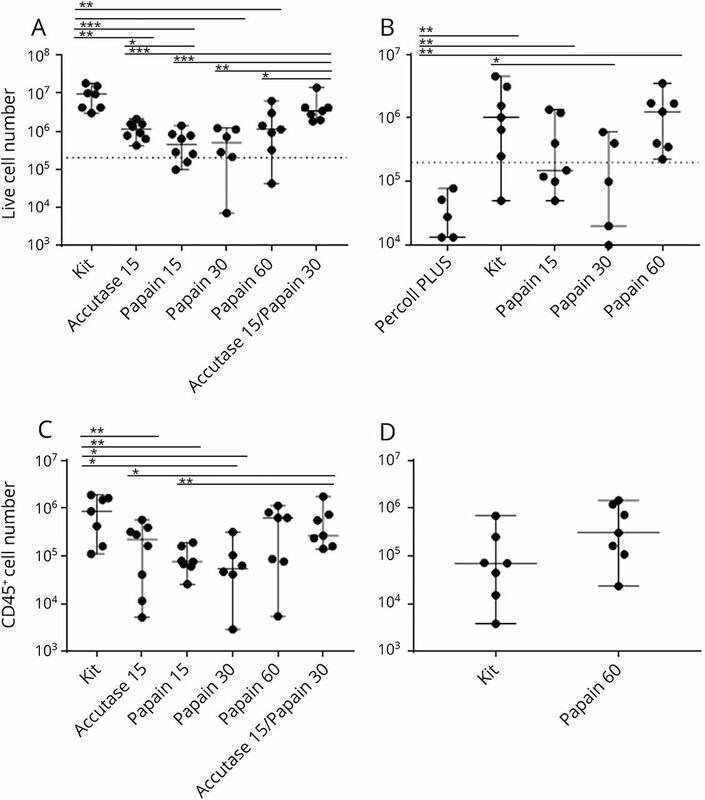 (E) Brain dissociation with Kit yielded a higher number of CD11b+ myeloid cells as compared to papain 15 and papain 30, and accutase 15/papain 30 treatment provided significantly higher cell numbers than papain 30. Groups were compared for normality by using the Kolmogorov-Smirnov test. Values were compared using the non-parametric test Mann-Whitney U test. *p < 0.05, **p < 0.01, ***p < 0.001. There was no significant difference between the 2 experimental groups regarding (A) CD3+ T cells, (B) CD4+ T cells, (C) CD8+ T cells, (D) CD19+ B cells, and (E) CD11b+ myeloid cells. Finally, the fourth requirement of our assay qualification algorithm, namely a correlation between absolute mononuclear cell numbers in brain and in spinal cord and experimental autoimmune encephalomyelitis (EAE) disease course was tested. (F) There was a significant correlation between live mononuclear cell numbers isolated from spinal cord tissue with Kit and clinical EAE disease severity. 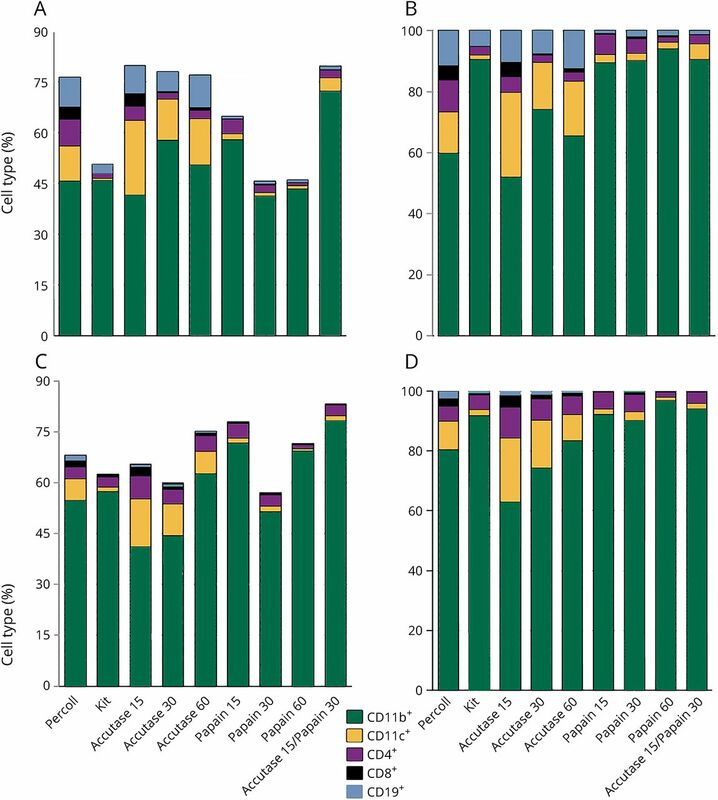 Analyses of mononuclear cell subsets in the brain or spinal cord did not demonstrate any significant correlations with EAE disease activity, regardless of the tissue dissociation method that was utilized. Each experiment was repeated at least once. Representative results are shown. Groups were compared for normality by using the Kolmogorov-Smirnov test. Values were compared using the non-parametric test Mann-Whitney U test. (A) To determine whether the different tissue dissociation methods would yield a similar cellular composition of mononuclear cells from brain tissue, the percent of CD11b+, CD11c+, CD4+, CD8+, and CD19+ cells gated from live CD45+ cells, and (B) subsequently normalized to 100%. (C) The same mononuclear cell subsets from spinal cord were then gated from the live CD45+ population, and (D) normalized to 100%. The mean of a minimum of 4 separate tissue dissociations are shown.